Дата создания - июль 1944 г.
Основными видами продукции являются твердые сыры, масло животное. Продукция, производимая комбинатом, реализуется на местном, республиканском и международных рынках. Крупные поставки осуществляются в Российскую Федерацию. Pinsk Dairy Plant specializes in dairy production and sale (solid cheeses, butter, dry nonfat milk, milk substitutes, casein). 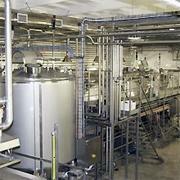 The plant has its own laboratory which is certified in accordance with STB standards ISO/MEK 17025. Modern equipment is being installed, new kinds of produce are being introduced, the produce is being accredited according to standards which are in law. Quality management system in compliance with STB ISO 9001-2001 standards, HASSP system (production and storage of pasteurized milk) have been implemented at the plant.